Like it or not, the best players in the game change teams regularly in today’s game. Take Cliff Lee, who has been traded three times in the past two years. Adrian Beltre, who joined Lee on the free agent market this winter, will play with his third team in as many years in 2011. Some players, like Derek Jeter and Todd Helton, seem destined to remain with the organizations that drafted and developed them, but that’s the exception these days, when players at just about every position become available through trades and free agency each winter. The one exception of the offseason was shortstop. A handful of solid everyday shortstops changed teams, but none of them could be considered elite players. Only one shortstop who switched teams this winter – Juan Uribe – placed among the top 100 position players in WAR last year (3.2). Other shortstops, including Jhonny Peralta, Miguel Tejada, Edgar Renteria, Alcides Escobar, Jason Bartlett and J.J. Hardy, changed hands through free agency and trades. The group includes a number of regulars with some impressive career accomplishments, but none of them performed at an elite level in 2010. In case it wasn’t already challenging enough to find top shortstops, some of the best ones around signed extensions that should keep them off of the market. Troy Tulowitzki signed a surprising nine-figure extension that will keep him in Denver for the next decade. Later in the offseason, the White Sox locked Alexei Ramirez up to a four-year deal, delaying his free agency by at least two years. 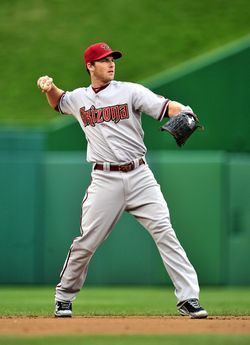 Diamondbacks GM Kevin Towers signed Stephen Drew (pictured) to a two-year extension after a year in which he posted an .810 OPS and a second consecutive above-average UZR/150 (10.0 in ’10). However, Drew’s deal is unlike the others in that it won’t necessarily postpone his free agency. If the D’Backs fall out of contention early again this summer, teams could inquire on Drew. Similarly, Jose Reyes could become available within a few months, so the market for shortstops could finally develop by the trade deadline. Given that elite shortstops are one of baseball’s most valuable, elusive commodities, expect the D’Backs and Mets to ask for multiple quality players in return for Drew and Reyes if they make them available. Braves have some solid SS prospects, but most of them are projected to be moved elsewhere. Hopefully one sticks and thrives, but I’d love to see Drew in a Braves uniform. They’ve certainly got the pitching to get it done, hopefully Jurrjens can be the center piece(unlikely, unfortunately). Actually, the Reds have a deal for Hanley Ramirez in the works right now. I could see the Red Sox getting Reyes or Drew to fill the one spot they dont have a perenial allstar, shortstop, oh and i guess at catcher too. Given how Lowrie played in the second half and Jose Iglesias waiting in the wings, i doubt they would wan’t to use the prospects and extention for what could be a marginal upgrade for Reyes. As for Drew, one’s bad enough. Yeah, it has been pretty difficult to deal with J.D. being a top 5 right fielder over the last three years hasn’t it? Over the first three years he was a top 5 RF, last season he dropped off. Given his decreaseing ability to hit leftys he runs a high risk of becomeing a platoon player over the season. Its not a knock on his health or playing style, just his diminishing ability. “As for Drew, one’s bad enough.” That doesn’t sound like you’re talking about his “diminishing ability”, or do you think his 28 year old brother is going to decline with him? By the way, one down year (talking about J.D. here) doesn’t necessarily mean that a player is declining. Stephen Drew is a good SS, but he has yet to show year to year consistency and the cost of tradeding for him would be high, as for J.D. his number vs. leftys last season were below the mendoza line and i imagine he will be platooned with cameron/5th outfielder agianst the tuffer leftys. He’s still good for a 2+ War if healthy, but at 35 odd are he wont recover to his 5.6 war of 2009. If you actually watched him you would have seen that either his career is in free fall, or he was hurt. He can’t hit a lefty to save his life, and he didn’t look right at the plate throughout the year. Now, this is JD that we’re talking about, so he very well may have just been injured. Hopefully he ends his contract on a high note. “If you actually watched him…” I watched every game he played last year; regardless of how he “looked” one year still does not mean a player is in decline. He struggled even worse in 2007 and came back to produce 4.0 and 4.8 WAR 2008-09 respectively. In ’07 he was dealing with family problems, and still displayed solid fundamentals. Last year his fundamentals at the plate were simply gone. Yes he was good in 2008 and 2009, but he’s lost it at the plate and should be a platoon player at this point, especially when we have a 4th OF who mashes LHP and plays plus defense. Drew has always been a guy who relies heavily on his ability to control the strike zone and, I don’t know if you noticed it but, the umpires were pretty obviously expanding the strike zone last year for one reason or another. Something like that is especially going to hurt a guy like Drew whose whole offensive game revolves around control of the strike zone. His Contact% percent was the highest of his career and his swstr% was the lowest of his career, so if anything he actually had BETTER control with the bat last year. The trouble was he was being forced to swing at pitches outside of the strike zone to compensate for the umpires expanding the zone: his O-swing% was up 5% to 20.6% and his O-contract% was up more than 11% to 70.2%. When you swing at pitches outside of the strike zone you tend not to make good contact, which shows up in his .282 BABIP (.032 point lower than his career mark). All it would take for Drew to perform to the same level as ’08-’09 is for the strike zone to go back to normal or him to adjust to it. It actually seems that he DID adjust as the season went on: the only month after April that he had a wOBA below .352 was August. So all of a sudden the commissioner is going to want to slow the games down again by going back to the old strike zone? 2010 vs LHP: .357/.438/.690 in 48 PA’s due to injury. Cam is of course healthy this spring and has looked great. As you can see he has performed above his career marks vs LHP in recent years and there is no reason what so ever to keep him on the bench against a lefty starter in favor of someone like JD Drew. JD should start against righties and Cam should start against lefties… a classic platoon. I think that debate has a clear winner…. If he struggles against lefties again this year then I think the argument that he should be a strict platoon player would be stronger, but he could just as likely go back to hitting like he did in ’08-’09; just because a player struggles for one year doesn’t necessarily mean he’s lost anything, it could likely have been a down year. The idea of platooning Cameron with Drew, at least on occasion, is a decent one even if Drew does go back to his previous self, but that speaks more to how good Cameron is than it does to how bad Drew is. and the whole compound, and I’ll spare your lives. Just walk away. I will give you safe passage in the Wasteland. Just walk away and there will be an end to the horror. 2010: .208/.302/.309 in 172 PA’s – largest sample yet, was he over exposed to lefties? Since coming to Boston, he’s had 2 years of above average production vs lefties and 2 years of below average production (’07 and ’10). In 2007 he had family issues, which were resolved prior to the 2008 season. In 2010 the strike zone changed (though only when lefties were pitching?). That isn’t going to back to how it was. The argument could be made that Drew’s always been a platoon player based on games played, but that seems like a cheap shot, so I won’t go there. But this is where you’re wrong: “at least on occasion”. Unless someone is hurt, Cam should be in RF against LHP’s, period. Why? If Drew goes back to his ’09 numbers against lefties (let alone his ’08 numbers) why would you sit him every time they face a lefty and risk hurting his production against righties because he isn’t getting regular at-bats? Especially considering there are other lefty hitters who struggle worse against lefty pitchers than Drew does (Ortiz for one). If he continued his steady decline where he dropped 50 points in OPS from ’08-’09 and project that out so it was a steady decline last year, he’s still 100 points below his ’09 production. Older players trend downward, with very few exceptions to that rule. As for Papi I agree completely, but there’s no need for Cam there. 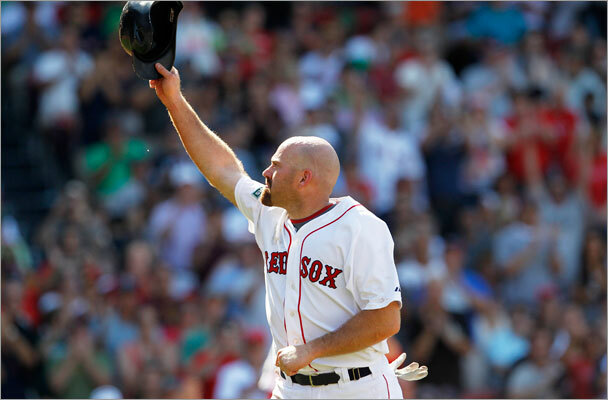 Youk hasn’t played 3B on a daily basis in years. He should slide to DH versus all but the 5 lefties Papi is good against and have Lowrie (OPS over 1.000 vs LHP in 2010 in a sample of 81 PA’s, .944 OPS in his career in a sample of 197 PA’s) play 3B. OPS is pretty near useless; his career wOBA vs. lefties is .340, last year it was .280 and in ’09 it was .382. After ’09 you should have assumed some regression to the mean, and the same goes for this year. Players don’t follow a steady line at any point in their career; you should pretty much always assume regression to the mean, so even if he only regresses back to .320 he would be a serviceable hitter against lefties again. I never said players follow a steady line, however for quick projection purposes and extrapolation steady lines can provide some sort of guidance. As for your claim that a player should always be projected to career averages…. I haven’t heard many statements that were this simple minded and simply unintelligent. I guess the entire notion of peak years and decline years is all a lie right? I mean, players are always the same at age 38 as they are at age 28, so why not sign players to 10-15 year deals without worry. And I don’t want to play a serviceable hitter against lefties in place of a well above average, borderline elite hitter against lefties. Drew isn’t the best option against lefties, period. That’s all there is to it. The argument could even be made that the extra days off will keep drew fresh given his tendency for nagging injuries. I already acknowledge Cameron being very good against lefties and said that it would be a reasonable argument to play him in place of Drew sometimes, because he’s so good, so you’re beating a dead horse there. As far as regression toward the mean; that’s the general rule as far as outliers go in statistics, and a 100 point drop in wOBA over one year to 60 points below his average would qualify as an outlier in my opinion. Again it’s regression toward the mean; that’s not to say that he will go back to his average but that he is most likely to move toward his average. It may seem like I’m beating a dead horse, but that’s only because you refuse to see that it should be an occasional thing, which is the stance that you have taken and continue to take. As for regression towards the mean, it may be a matter of semantics, but players don’t regress towards their career mean, rather they regress generally along a bell curve (standard practice for projecting performance many years out and frequently used in cases such as Crawford’s deal, ARod’s deal, Pujols’ next deal, Tulo’s deal, etc, etc. Is this in the same direction as the players mean? Sure more often than not, but that isn’t defined as regressing towards the mean, rather towards a separate curve. I find it apropos that “regression to the mean” is sometimes referred to as “reversion to mediocrity”, cause that’s how Drew will play this year: mediocre. Will he? Can I get the powerball numbers while you’re at it? forget powerball! Mega Millions is at $244M! Also, you take the information that you have and go with it. There is no let’s hold off another year in this case. Both Drew and Cam will be gone. You do what makes sense to win now and that is clearly a platoon. An article like this makes me sad that the Braves traded all of that potential with Escobar. They improved defensively and offensively marginally(debatable) for 2 years, but lost out on a possible top level SS. I hope one of their prospects sticks at short and plays well enough to get me to forget it. As unfortunate as it is, his attitude made it impossible for him to be a long-term brave. yet his attitude has flourished so far in Toronto, go figure. Yes, he is a very talented young kid and i loved watching him play. It’s a shame it didn’t work out with him in ATL. I was skeptical after talking to a bunch of friends in Atlanta after the trade..
but after watching him play for half a season I can’t believe the Braves gave him up. If he hadn’t struggled last year, he never would have become available. We absolutely hit the jackpot on Escobar. I’d be shocked to see less than .275/.350/.425/.775 with 10 HR and 10 SB, along with obviously plus defence. It really was a perfect storm. Alex Gonzalez was absolutely raking at the Dome, and other AL bandboxes, while staying healthy and playing great defence. We must remember that the Jays sent a promising SS in Pastornicky, and a good young arm in Collinsecum. They could both be contributers at the MLB level. But so could Jo Jo Reyes. I’m sure he’ll be throwing a plus change by May. Overall, we got lucky. Escobar’s potential has been proven. He could emerge as a top 5 SS in 2011, as he basically did in 2009. Good AVG + high OBP + bit of pop + great defence = elite. Every Braves fan had the same projection coming into last year. Only to have him plummet to a 238/334/284. Looking at that I am suprised by his OBP and amount of walks. His attitude looks pretty positive in Toronto. He is part of the emerging Latin core. Thanks again. OR they pull off a trade for Stephen Drew. Also, I’d be shocked if Gonzalez out-produced Escobar on offense this season. Sadly, same goes for their defense. But Wren isn’t stupid, they knew the talent Escobar had. They must’ve felt he was too big of a distraction. they wanted to win last year, in bobby’s last year. in my opinion, if it hadn’t been for that and his offensive struggles early on, I don’t think they make that trade. I hate the idea of losing Reyes but the thought of a boat load of prospects is tempting. No mention of super elite shortstop Yuniesky Betancourt changing teams? My bet is Furcal stays healthy the whole year and then NedCo resigns him again. I would seriously loose it. A healthy Furcal is an elite player.. But then again, healthy is just a word. No mention of Alex Gonzalez changing teams via trade. I would consider him to be at the bottom of the “defensively” elite class of shortstops. A career average +7.4 UZR/150, +3.4 WAR.